My weekend was actually pretty great. Uneventful, but still fun! I nannied from 7:30 to 4pm. It's been going great &, luckily, the kids are so well behaved and easy to entertain. And there's a park a block from their house so I've developed a pretty nice tan over the last few days. Their puppy, Lola, is basically attached to my hip throughout the day. The little boy was complaining of boredom, so I pulled up Legends of the Hidden Temple on YouTube & he loves it now! Thank you '90s Nickolodeon! And I'm not ashamed to say I fell asleep at 9pm and slept until 8:30am on Saturday. I was exhausted! Last week, I found a great pair of skinny jeans.....AT WALMART! What?! I said they were $10 on Instagram, but I totally forgot that I actually got them for $5! I got the mint color above and a coral color as well. They are super comfy, super flattering, and the perfect length. Who would of thought Walmart sells some cute clothes? I went to Target Saturday afternoon. I much prefer going in the mornings or during the weekday. SUPER PACKED with a bunch of unsupervised kids screaming and running around. I usually enjoy my Target experience, but I definitely didn't enjoy it this week! We also went to Glynner's for a beer and app. Yummy loaded french fries! My brother and his friends rented the Pedal Pub Saturday night and my mom & I wanted to see how it worked. So we drove downtown & stalked them. Apparently it's a ton of fun. I don't think my short legs would be able to jump on those high seats! I woke up to the sad news that Cory Monteith died. I was/still am shocked. My first thought was poor Lea Michele (they were dating). 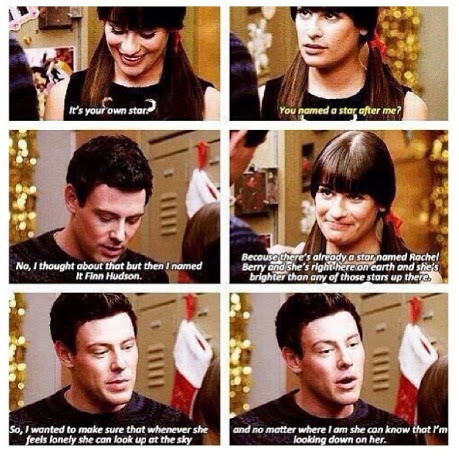 I wonder how Glee will address this in season 5. I found this little screencap from a scene in Glee &, not gonna lie, teared up a little at how appropriate it was. Let the rocking out to Cory's Glee songs commence. To end the night, Maggie Rose was playing in Sunday's Down by the Riverside free concert. She was actually really good! You should check out her songs "I Ain't Your Mama" & "Better".